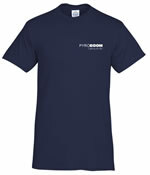 PYROBOOM T-Shirt! Very comfortable and just flat out awesome. The writing on the front is white and says PYROBOOM Light up the Sky! Shirt color is navy blue. Select your size below. There is nothing on the back. 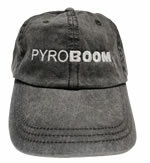 Want some shade for your eyes while you sport an awesome looking Pyroboom baseball cap? This Khaki baseball cap has a Velcro adjustment. This cap will make you look like a Pyro King when you are out in the field setting up your show. The design is different the picture. It does not say "light up the sky" and has navy blue trim. 6-pack of Pyroboom pencils. Great for drawing on wood for your rack builds. These pencils will make your racks look even better! If you order a quantity of 1 you will receive 6 pencils. Key chain tape measure. Convenient and practical. The tape measure is 36" long.